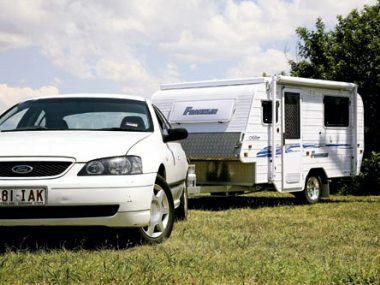 There were smiles all round at Kratzmann’s Cars and Caravans when we collected our review caravan, a Franklin Micro. Proprietor Gary Kratzmann would normally lend us his big 4WD for towing but it wasn’t available. Instead, he rather apologetically offered us a Ford Falcon, a few models old. I, on the other hand, thought it was more than suitable. We are always keen to promote economical towing options, and this Falcon-Micro combination fitted the bill. The pop-top Micro is a very light caravan indeed. With an ATM of 1240kg and a Tare of 940kg, it suits a wide range of tow vehicles. In addition, when empty, it has a very light ball weight of 40-50kg asnd can be lifted by hand. Behind the Falcon, we towed the Micro out on suburban streets and on the freeway. The six-cylinder Ford certainly coped without difficulty, and surprisingly the rig remained stable despite my reservations about the light ball weight. I would imagine that filling the water tank would solve any concerns in that department. When hitched up behind the tow vehicle and with the roof down, the Micro has quite a low profile. In many respects, the Micro looks like a conventional pop-top caravan. The only unusual thing I noticed was the front top part of the van’s body, which overhangs the drawbar. This gives a bit more space inside and allows an optional storage box to be fitted on the drawbar. The SupaGal box section chassis, rear bumper, quick-drop corner stabilisers and leaf spring suspension are conventional. Alloy wheels add a touch of class, with the spare mounted on the rear bumper bar. Although there isn’t the usual front boot, external storage is still well catered for with a rear tunnel boot and a front offside bin. Awnings are always a bit tricky on small pop-top caravans, but this one works quite well and is easy to reach when the pop-top is down. Keep in mind, though, that the wall arms block the front nearside window and rear bin door. Body construction is standard with a timber frame, insulation and aluminium cladding. The pop-top with its vinyl gusset sits slightly higher than usual but that’s to compensate for the lower caravan body. The arrangement works well because the vinyl gusset has quite large windows, thus improving the internal space perception. Acrylic hopper windows are used all round and the door is the familiar Camec triple locker. Another asset of this little van is that it is very easy to unclip the pop-top. Once that’s done, along with switching the A&E awning to the ‘open’ position, it’s a matter of stepping inside and lifting the roof. The Micro interior appears spacious for a 3.7m van, even with the double bed across the rear. 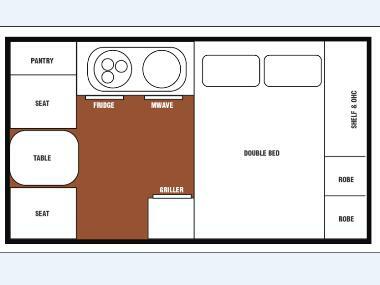 The dinette sits across the front of the van and the kitchen bench fills the remaining offside area. In the solid wall area, the ‘timber look’ predominates, which can be a bit overpowering in a full-height van, but the lighter shades of the pop-top tone it down. It’s not surprising that the 1.88x1.52m (6ft 2in x 5ft) bed takes up most of the rear space of the van. It has windows at the foot and head of the bed and a small wardrobe area along the rear. The cupboards and hanging area are a bit awkward to use, given that the bed is in the way, but it’s certainly better than nothing at all. Part of the underbed area is occupied by the rear tunnel boot but a door under the bed also offers storage space. If you like everything close to hand, then this little kitchen will certainly keep you happy. Atop the bench is a combo stainless steel unit with a three-burner Smev cooktop and stainless steel sink. Both have smoked glass lids and above the cooktop is a slimline fume extractor. A powerpoint is fitted at the front end and a bed reading light doubles as a bench light. A problem with this setup is the risk of washing-up water splashing on to the bed. A splash panel might be helpful, otherwise a plastic tray or sheet on the bed will improve the situation. Fitted under the kitchen benchtop are a 90L Dometic fridge and an LG microwave. There is also a small floor locker under the microwave. Quite a few small RVs (and even some larger ones) don’t come with a grill/oven. 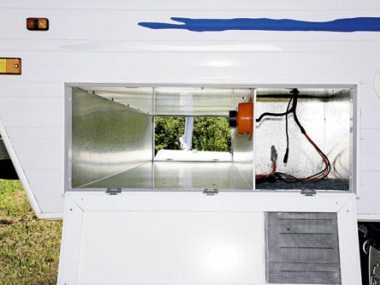 Well, this van does: a Smev unit is fitted into the cabinet that sits between the door and the bed. In addition, the cabinet has two drawers with a floor locker, and the shelf area can be used for a TV and DVD player as it has a powerpoint and antenna connection. Up front is the two-person dinette. It’s not quite a full-width item because behind the offside seat, a small cupboard has been squeezed in. It has space below the level of the seat back and also a couple of small shelves. In addition to that cupboard, there are also narrow storage areas across the front, as well as the under-seat areas. Timber pelmets above the windows offer knick-knack storage suitable for keys and a torch by the door. The little Franklin Micro is certainly a package that works well for the small van buyer. In addition to our review van, there are single-bed, rough-road and shower/toilet layouts available. 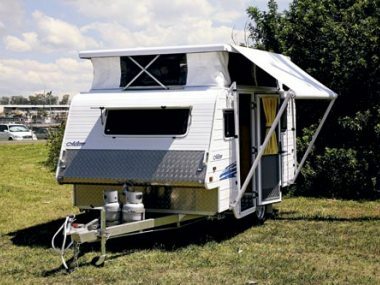 Quite a few purchasers looking for accommodation that’s easy to tow opt for a camper trailer, but the Micro is an interesting alternative as it offers the caravan lifestyle without the weight and size that often goes with it. 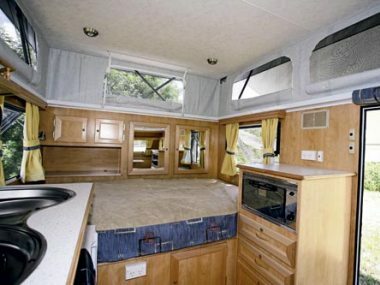 As featured in Caravan World issue 464, March 2009.